The other day I came across a cool video on YouTube of a fantastic saxophone player performing a very original version of the classic standard Stand By Me by Ben E King. Besides being thoroughly impressed with the slap tonguing/beatboxing performance in some freezing cold alley, I thought, this song is a perfect example of what we are working on in the Pentatonic Foundation course and I should make a blog post about it. Not only is this another pentatonic scale melody, but it is one of the most played cover songs of all time worldwide. If you ever play in any sort of group that performs popular cover tunes, chances are you will play this song. You will probably also be expected to play a solo during the solo section so we’re going to discuss how to go about playing a good one. Stand By Me offers us a great opportunity to explore several key aspects of what it means to be a saxophone player in a contemporary group. Learning a melody by ear using the pentatonic scale. Guitar keys on the saxophone. Even though this song is really old now (1961), it is more modern than what we consider the “jazz standards” repertoire. The jazz standards also come directly out of the most popular songs of their era which was mostly songs from the 20s-50s. Nowadays, much of that repertoire is no longer recognizable by the general public. A good way to connect with an audience is to “play something they know” (obviously right?) Paying gigs have set lists of modern standards which are from the 60s – today so you should learn them. 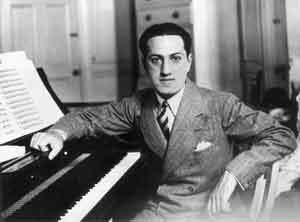 Unlike most of the jazz standard repertoire, the modern standards often have simpler melodies. 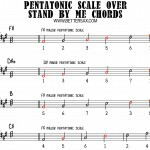 Many are like Stand by Me and are very pentatonic based. 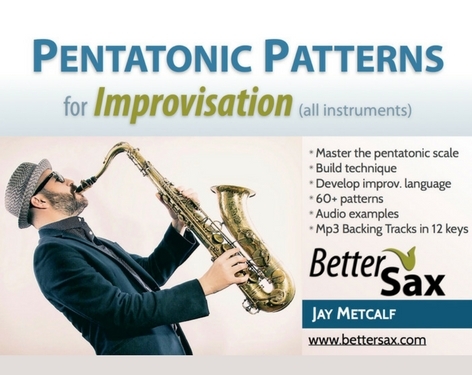 Pentatonic melodies are easily remembered and often catchy which helps to explain their popularity. More reasons to study this scale. We are going to learn the melody by ear but be thinking about the corresponding pentatonic scale at the same time. The reason we must do this is so that we can play this song in any key if need be. 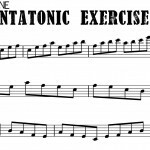 If we learn our Pentatonic scale in all 12 keys, and we know a given melody is entirely pentatonic based, we should be able to play that melody in any key. Since you will most likely be performing this song alongside a singer 1 key is not enough. Different vocal ranges = different keys. If I play in 3 different cover bands one week, I may play this song in 3 different keys. I had some fun and made a backing track using Garage Band trying to recreate the original recording. I’ll admit that I left out a few details, but this was a fun little ear training exercise for myself. Go ahead and put the backing track on and try to figure out the first note of Stand By Me on your saxophone. Take this one step further, and try to figure out what key we are playing in if you don’t already know. This is something we have to do as saxophone players all the time on the bandstand, and it is a very good idea to practice this skill beforehand. There’s nothing worse than being on stage about to take a solo and not knowing what key the band is in. If you don’t figure it out quick you’re in for a rough ride. That’s a topic for another blog post I think. To get the first note of the melody, hear it in your head, sing the note, then find that note on your saxophone. Once you’ve got the first note of the melody figure out the rest one note at a time in the same way. Hear, sing, play. Play the melody by ear on your own and along with the backing track and memorize it. While you do this, be thinking about the number or degree of the scale for each note you are playing. Doing this will allow you to play the melody in the other keys. If you want to challenge yourself, play this melody in some other keys Again think about the number or scale degree for each note you play. The more you do this the better prepared you will be for on the fly situations that come up at jam sessions and gigs all the time. You’ll also learn song melodies much faster. 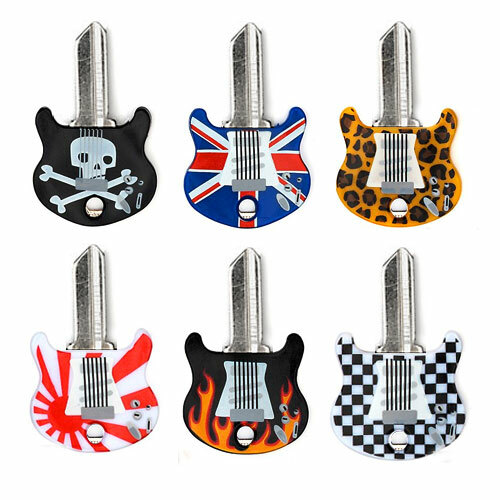 Those keys with all the crazy sharps in them are what I call guitar keys because Only guitar players like those keys. This is because it allows them to play “open” chords which are easier and sound better on their instrument. When their vocal range does not allow them to play a particular song in a key with lots of open chords a typical guitar player will reach for his trusty capo and change the sounding key of the song, but not the chord shapes. Sometimes this will put us in a nice saxophone friendly key, but usually they end up in just another horrid nightmare tonality. So while the singer gets to play his instrument and sing always in the most comfortable key, us poor saxophonists are forced to flail about on stage in 5, 6 and 7 sharps. There’s nothing to do but practice our “guitar keys” a lot. Since they lay so awkwardly on the saxophone you actually have to practice them more than the easier keys. 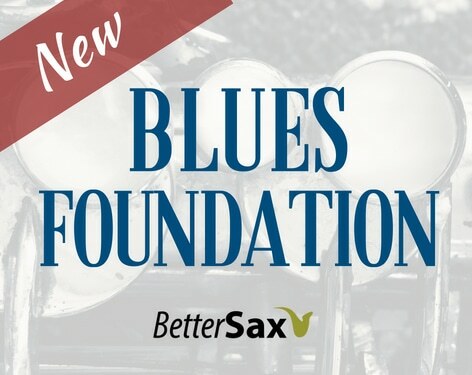 A good place to start is by taking the various exercises from the Pentatonic Foundation course and applying them to the following keys on your instrument: A, E, B, F#, C#, and Ab if you play alto. Don’t let guitar players expose you on stage. Practice your guitar keys! 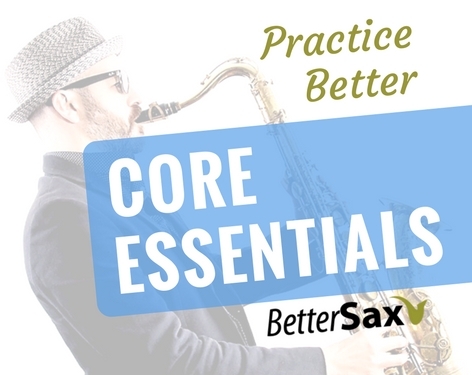 It’s important for saxophone players to know and understand the chords of the songs we are playing even though we don’t play chords ourselves. This topic can be a bit intimidating if you don’t play a chord instrument like guitar or piano. I recommend learning how to play basic chords on one of those instruments if you don’t already know how. This will help you in all aspects of your music. Stand by me has 4 different chords in it. Using the same number system we learned about in the Pentatonic Foundation course, these chords are 1, 6 minor, 4 and 5. If you know your major scale in any given key, you can quickly figure out the chord progression. In our key of G major (concert) these chords are: G, E minor, C and D. If you play tenor/soprano: A, F# minor, D and E. Alto players: E, C# minor, A and B. 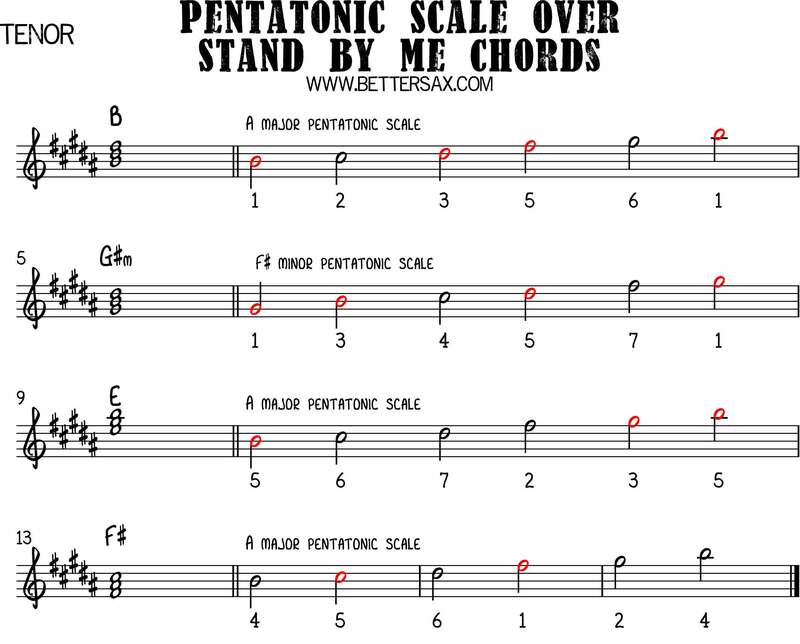 Check out the sheet music download to see how the major pentatonic scale fits over each of these chords. 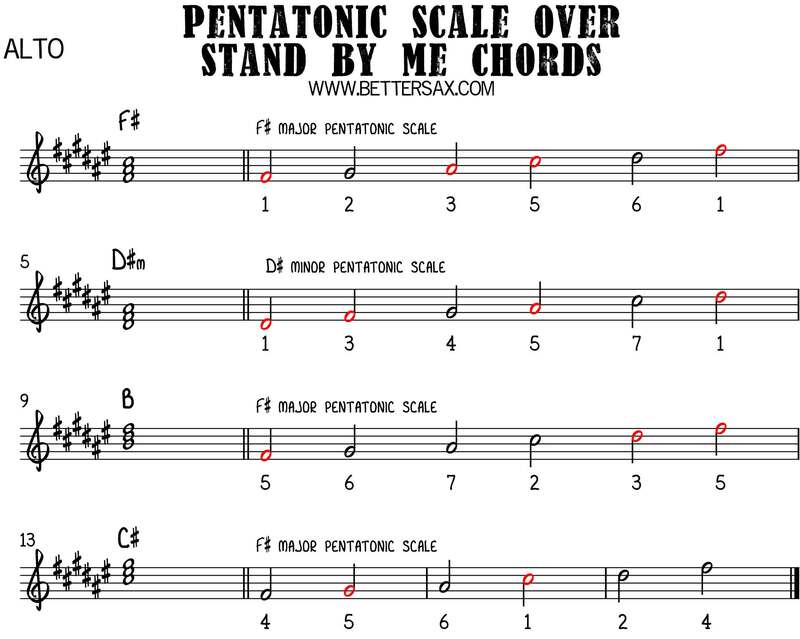 See how the notes of the major pentatonic scale fit over the 4 different chords of Stand By Me. The notes highlighted in red are chord tones. The 1 and 6 chord are relative, which means they share the same key signature. Refer to the lesson Minor Theory in the Pentatonic Foundation course if you’re not sure about relative major/minor keys. For soloing, you can play the same pentatonic scale over all 4 of these chords. 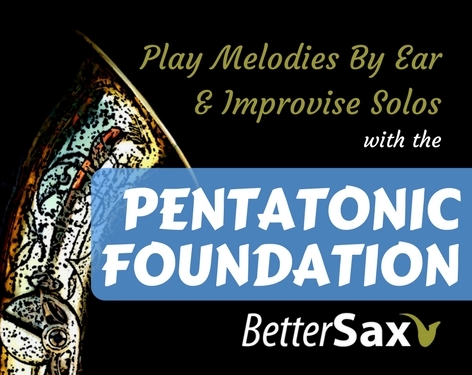 You can practice all of the exercises from the Pentatonic Foundation Course over this chord progression. You just have to transpose them to the correct key. Refer to this pdf of relative major and minor pentatonic scales in all 12 keys if you aren’t sure of the right notes. 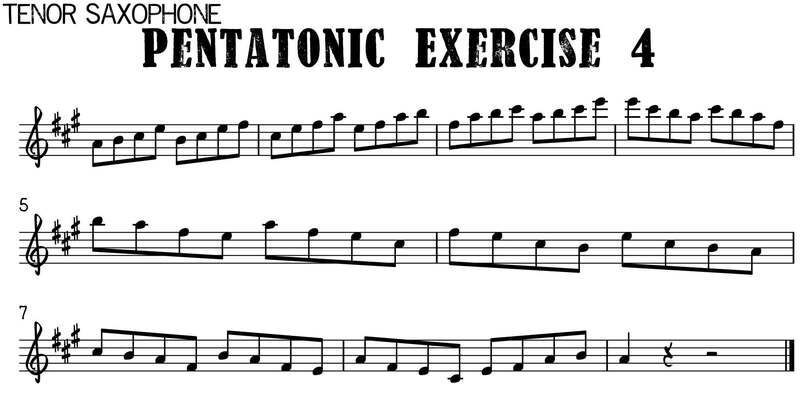 Now try playing Pentatonic Exercise 1 and Pentatonic Exercise 2 (you must be enrolled in the Pentatonic Foundation Course for these) over the backing track for Stand By Me. this is a great way to get familiar with this key and hear what each note of the pentatonic scale sounds like over the different chords. 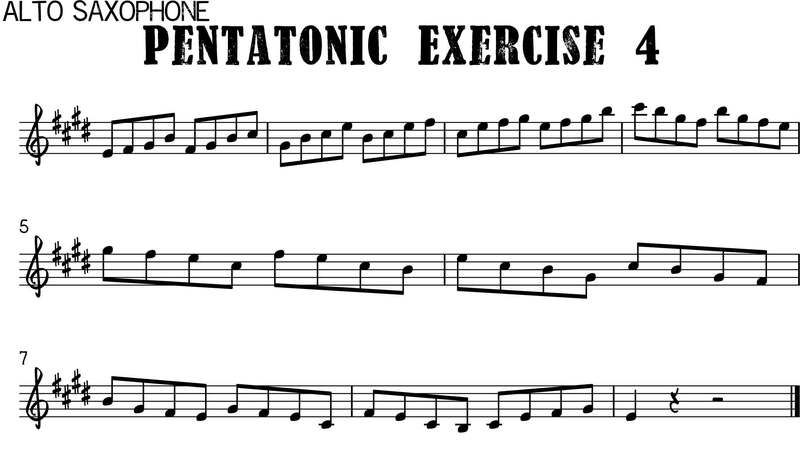 I’ve included another exercise we will call Pentatonic Exercise 4. You can get a lot of mileage out of this one. 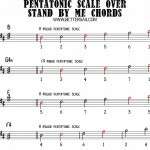 Try practicing Pentatonic Exercise 4 over the Stand By Me backing track. Don’t forget to play it slowly at first. Use half notes or quarter notes, until you get this under your fingers in this difficult key. I’ve recorded an example of the sort of solo you can create just by using the pentatonic scale. See if you can copy some of the lines I play. Have fun practicing, and please share your questions and comments below. Jay are you playing a Tenor in the video? Yes, that’s my Selmer Mark VI tenor.